NASA works with industry partner Nanocomp Technologies Inc. of Merrimack, New Hampshire, to advance manufacturing of carbon nanotube composite materials. On Oct. 29, 2018, NASA visited Nanocomp’s facility to discuss next steps for this technology. Photo courtesy of NASA. NASA is advancing technology that could use large amounts of nanoscale materials to launch lighter rockets and spacecraft than ever before. 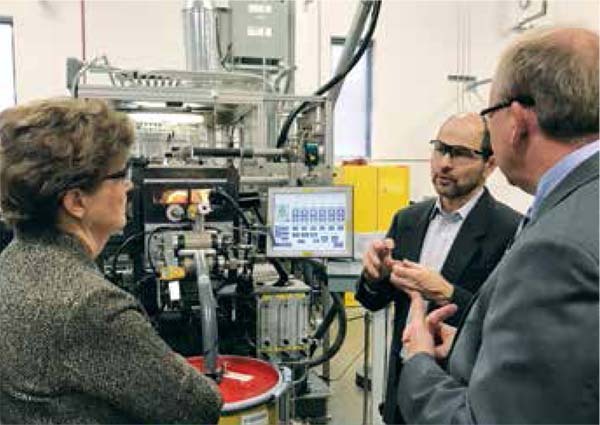 The Super-lightweight Aerospace Composites (SAC) project seeks to scale up the manufacturing and the use of high-strength carbon nanotube composite materials. Led by NASA’s Langley Research Center in Hampton, Virginia, a team of researchers is working with other NASA centers, government agencies, academia, and industry partners to move this technology forward. Eventually, carbon nanotube materials could be used to make rocket and spacecraft components. That’s why NASA’s Game Changing Development program funded a Phase III Small Business Innovative Research (SBIR) contract with Nanocomp Technologies Inc., of Merrimack, New Hampshire. 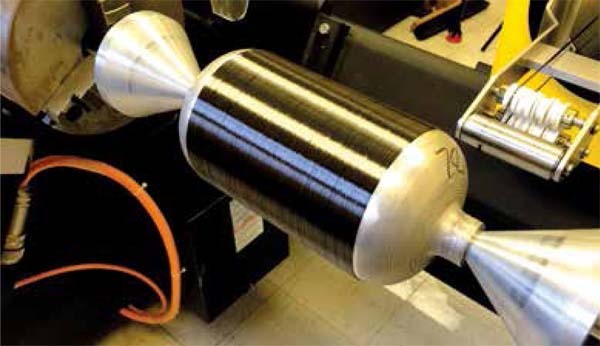 Nanocomp is working to scale up manufacturing capabilities and lower production costs of high-strength carbon nanotube yarn, building on previous SBIR awards from the Department of Defense and NASA. A demonstration flight article is wound with carbon nanotube composites. Photo courtesy of NASA. A flight test in 2017 demonstrated that the material can be used for composite overwrapped pressure vessels (COPVs), which are designed to hold fluid under pressure and are used in many capacities, such as propellant tanks. The COPV was the first large item NASA built using carbon nanotube composites. Another NASA Phase III SBIR contract was awarded to San Diego Composites in California. Expanding on work started under Phase I and II Missile Defense Agency SBIR awards, the company will be building prototype COPVs made with carbon nanotube materials. NASA is also working alongside 11 universities, two companies, and the Air Force Research Laboratory through the Space Technology Research Institute (STRI) for Ultra-Strong Composites by Computational Design. Led by Greg Odegard, a professor at Michigan Technological University, the institute is receiving $15 million over five years to accelerate carbon nanotube technology development for NASA. This institute engages 22 professors from universities across the country to conduct modeling and experimental studies of carbon nanotube materials on an atomistic molecular level, macro-scale and in between. The Super-lightweight Aerospace Composites project is funded by NASA’s Game Changing Development program, which aims to advance exploratory concepts and deliver transition-ready technology solutions to NASA missions and industry. The Small Business Innovative Research/Small Business Technology Transfer program encourages small businesses to develop innovative ideas that meet the specific research and development needs of the federal government. Phase I results provide a sound basis for the continued development, demonstration, and delivery of the proposed innovation in Phase II and follow-on efforts. Phase III supports the commercialization of innovative technologies, products, and services resulting from either a Phase I or Phase II contract. Both programs fall under NASA’s Space Technology Mission Directorate.